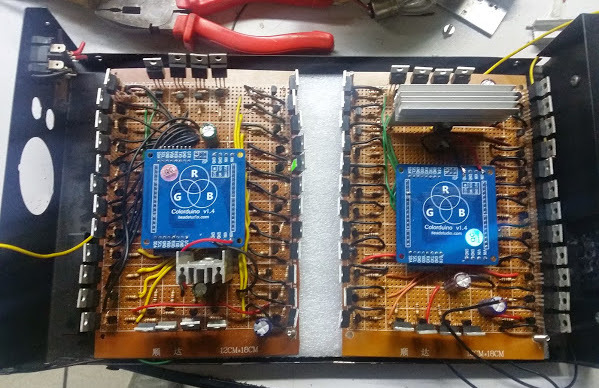 The project took around 450 meters of RGB strips controlled by two Rainbowduinos and driven by sixty-four power Mosfets, sixty-four bipolar transistors, and a few other components. Producing white light from the LEDs draws 8 amps from the power supply. A few years ago, [Steve] of Big Mess ‘O Wires fame stuffed one of the first Macintosh computers into an FPGA. While the project worked and was able to run System 6 on a virtual CPU, there were a few problems: it wasn’t exactly stable, and there was no support for a keyboard, sound, SCSI, or serial ports. Now, there’s a new tiny FPGA board around, and this one is perfectly designed to fit the original Macintosh on it. It’s much more stable, and there is a floppy disk emulator on the horizon, just so you won’t have to deal with all those 400k 3.5″ disks anymore. [Steve]’s brand new Mac Plus is based on the MiST board, an FPGA board that was originally designed to emulate the first Amigas and the Atari SE on an FPGA and a separate ARM CPU. There’s already been a lot of classic computers ported to the MiST, and the classic all-in-one Macs are the last project that’s left. In the video below, you can see the MiST board running the classic System 6 at SVGA resolution. That means MacPaint and Shufflepuck in one compact board using modern hardware. [Battelle], an Ohio-based non-profit R&D firm has just unveiled a device they call the DroneDefender — a long-range anti-drone defense weapon. It almost sounds like they’ve brought the fictional drone hunter’s RF cannon to life. But does it really work? According to the site, it uses radio frequency disruption to blast unwanted drones out of the sky. Cool concept, but does it actually work? Unlike the hackable MAVLink protocol used by Parrot AR, ArduPilot and a handful of other consumer drones, this weapon uses brute radio signal force to disable any(?) consumer drone. There’s a video after the break demonstrating a simulated use of the technology, which leaves us a bit confused. They show the drone slowly landing all nicely after being “guided” down by the rifle. If the system is jamming both GPS and the 2.4 GHz control link, the behavior will all depend on the software loaded on the drone. Some will go to a fail-safe mode, which is low throttle or motor power off, assuming the pilot has set fail-safe. Others may attempt to loiter on IMU sensors only. Bringing women into technical education at times seems to be an insurmountable challenge. As a counter, a small drawing robot created by [MakersBox] might help. The robot was used in a ChickTech workshop for teen girls. “Turtle draw” by Valiant Technology Ltd.. The goals for the robot were to have an easy to build, easy to program robot that did something interesting, and was also low-cost so the workshop participants could take it home and continue to learn. These requirements led [MakersBox] to the Adafruit Pro Trinket 3V, stepper motors for accuracy, and a 3d printed chassis to allow for customization. Drawing robots like this for education are not new. [Seymour Papert] created one of the first turtle robots, seen at the left, in the 1980s. 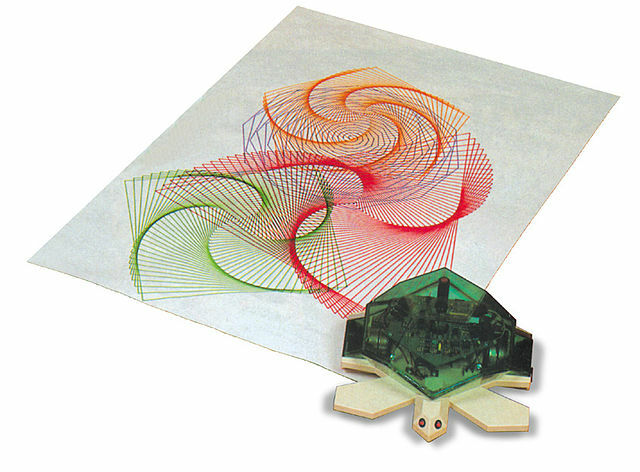 He even created the Logo programming language and adapted it for use with the turtle. An interesting similarity between [MakersBox’s] and the original turtle is the drawing pen is in the center of both. Hat tip to our friends at Adafruit. A rose, is a rose, is a rose, even if drawn by a robot, after the break. It shouldn’t come as much of a surprise that more than half of the world’s population doesn’t have an Internet connection. It’s tricky to get an exact figure on this, however the number of people without connection is commonly agreed to be somewhere around 2/3rds of the population of the planet. There are some heavy hitters working on this problem with some pretty interesting solutions. OneWeb is an outfit with [Richard Branson] as the front-man who plan to launch low orbit satellites to communicate with ground terminals. The ground terminals would rebroadcast the communication signals from the satellites resulting in 2G, 3G, LTE, and WiFi signals for those near a ground terminal. SpaceX is throwing its hat in the ring with a little helpful funding from Google and Fidelity to the tune of $1 Billion. Perhaps the most surprising is [Zuckerberg’s] solar-powered internet laser beaming drones. The idea is that these laser birds will circle over an Internet dead-zone like buzzard over a dying buffalo (reaching?) and provide connectivity to those below. The solar drones will fly at an altitude of 20km which is a pretty good ways up there, and they are believed to be able to stay in flight for months at a time. There’s a Facebook PhD explaining this in a video after the break, thanks Dr. Facebook.